Jane Digby was an English aristocrat who lived a wild and scandalous life with four husbands, many lovers and died as the wife of an Arab Sheikh. Jane was born in Dorset, daughter of Admiral Henry Digby who founded the family fortune when he seized a Spanish treasure ship. Admiral Nelson’s command, he fought in the Battle of Trafalgar. Jane was a society beauty, with waist-length golden hair, glowing cheeks, keen intelligence and an irresistible charm. Jane was married, aged just seventeen, to Lord Ellenborough. He was twice her age and after Jane had affairs with her cousin and Austrian prince, Felix Schwarzenberg, left him in what was one of England’s most celebrated divorces. Jane and Prince Felix had two children but their affair didn’t last; ending shortly after the death of their son. 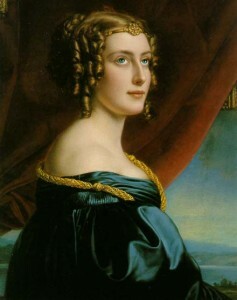 Jane then moved to Munich and became the mistress of King Ludwig I of Bavaria. While in Munich Jane met and married Baron Karl von Venningen. Jane bore him two children but then fell in love with a young Greek count, Theotokis, who fought Venningen in a duel while eloping with her. Venningen released Jane from the marriage (and took care of their children) and Jane married Theotokis and moved to Greece. They had one son, but following his fatal fall from a balcony, Theotokis and Jane divorced. King Otto of Greece became Jane’s next lover, closely followed by a Greek general. Jane acted as queen of his brigand army, lived in caves and rode horses in the mountains. Jane walked out on him when he was unfaithful! From Greece Jane travelled to the Middle East, and fell in love with an Arab Sheik, twenty years her junior. When they married under Muslim law Jane took the name Jane Elizabeth Digby el Mezrab. For six months of each year Jane and Sheikh Medjuel el Mezrab lived the life of desert nomads and during the remaining months they lived in a splendid palace in Damascus. Jane adopted Arab dress and learned Arabic, being already fluent in eight languages. Jane’s final marriage was a happy one and lasted until her death, of fever and dysentery, 28 years later. She died in Damascus and her grave can still be seen in the Protestant Cemetery.